The Hell-Volhardt-Zelinsky [HVZ] reaction is a means of converting a carboxylic acid to a brominated carboxylic acid (the bromine ends up on the α carbon of the carboxylic acid). The Hell-Volhardt-Zelinsky reaction is a reaction used to convert a carboxylic acid with α hydrogen into an α-halo carboxylic acid. The reaction is initiated by addition of a catalytic amount of PBr3, after which one molar equivalent of Br2 is added. Because the highly corrosive PBr3 is difficult to handle, it is often generated in the reaction flask. This is achieved by the addition of a little elemental phosphorus to the mixture of starting materials, it is converted into PBr3 instantaneously by the bromine present. PHASE 1. Conversion of carboxylic acid to acyl bromide. The hydroxide is a bad leaving group but when oxygen attacks phosphorus it becomes a good leaving group. Actually, phosphorus tribromide works by turning the hydroxy group into a better leaving group. Because the P-O bond is formed, the P-Br bond is broken and the bromide ion is expelled. But in the next step, this bromide ion attacks the carbonyl carbon, π bond breaks, and the tetrahedral intermediate is formed. Then, the carbonyl group is reformed and a good leaving group is expelled which was formed in the first step. PHASE 2. 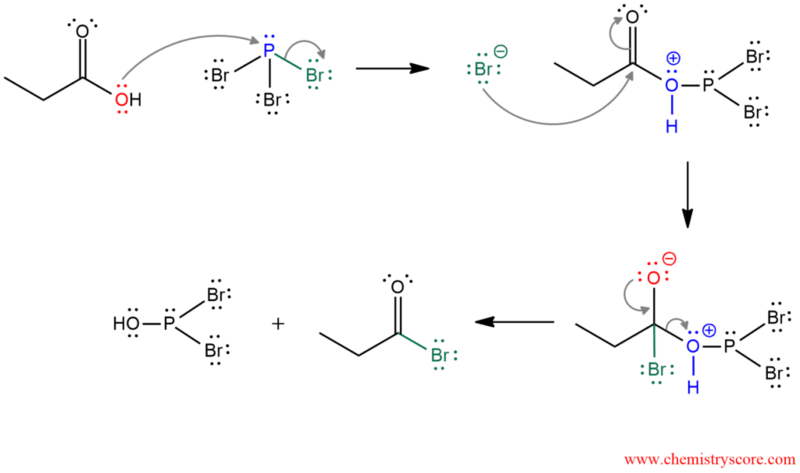 Keto-enol tautomerization. The carbonyl oxygen is protonated by acid (HBr). Then, the bromide ion, as a weak base, captures a hydrogen in the α position. These electrons form a double bond and push electrons of π bond to oxygen removing the positive charge. HBr catalyst is regenerated and enol form of carboxylic acid is formed. PHASE 3. Bromination of enol at the α carbon. One pair of electrons on oxygen form a double bond and the existing double bond attacks one of the bromine atoms expelling the other one out. This bromide ion removes α hydrogen creating another HBr molecule which in the absence of water evaporate as a gas from the solution. PHASE 4. Hydrolysis. When water is added, the acid bromide is hydrolyzed to the carboxylic acid. Acid bromide is very reactive and oxygen from water attacks the carbonyl group making an intermediate with a good leaving group (bromide). When carbonyl group is reformed, this bromide ion is expelled as a leaving group. Then, another molecule of water removed hydrogen and returns back into carboxylic acid.